The scene of the Hanscom Field plane crash. BEDFORD — Investigators on Monday recovered the flight-data and cockpit-voice recorders from the private jet that hurtled off the runway at Hanscom Field two nights earlier, critical pieces of evidence that could show why the Gulfstream IV failed to take off and shattered in a fiery crash that killed seven people. The discovery was announced by the National Transportation Safety Board shortly after 6 p.m., following a day in which more than a dozen investigators scoured the charred remains of the private jet in a steep, narrow gully about 600 yards beyond the runway. A crane had been brought to the site to help uncover the recorders. 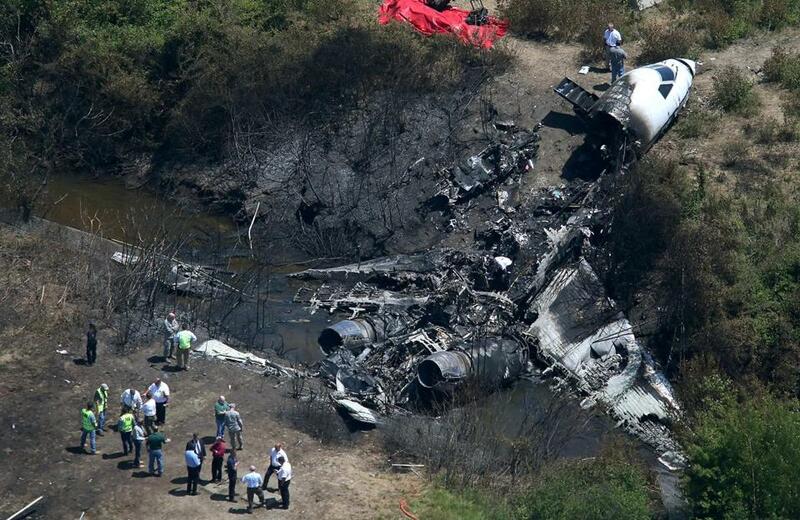 While the cause of the crash remained uncertain Monday, pieces of information about the flight’s final seconds emerged. No hydraulic fluid was found on the runway, ruling out a leak of such fluid as a cause. And authorities said there was no evidence of a delay in takeoff. Monday also brought identification of the doomed jet’s flight crew. Luke Schiada, who is leading the NTSB inquiry, said investigators are gathering information about the crew’s history, as well as reviewing weather information, maintenance records, witness interviews, and surveillance footage. The seven victims included Lewis Katz, the 72-year-old co-owner of The Philadelphia Inquirer, three acquaintances, and three crew members. Katz had flown to Massachusetts on Saturday to attend a fund-raiser at the Concord home of historian and author Doris Kearns Goodwin and her husband, former presidential adviser Richard Goodwin. The pilot and copilot, identified by the Middlesex district attorney’s office, were veteran aviators. The pilot, James McDowell, 51, of Georgetown, Del., listed 18,500 hours of flying experience in his most recent application for a medical certificate from the Federal Aviation Administration, Schiada said. Copilot Bauke “Mike” De Vries, 45, of Marlton, N.J., had logged 11,200 hours in the air, Schiada said. The plane, built in 2000, had been airborne for 4,950 hours. FAA records show that McDowell was a certified pilot, flight instructor, ground instructor, and mechanic. Notes from a medical certification in February indicate that he needed glasses for near vision. Other victims included the flight attendant, Teresa Ann Benhoff, 48, of Easton, Md. ; Anne Leeds, a retired preschool teacher from Longport, N.J.; Marcella Dalsey, executive director of the Drew A. Katz Foundation; and Susan K. Asbell, who served with Dalsey on the strategic planning committee of the Boys & Girls Club of Camden County, N.J.
Schiada said he would not speculate on the cause of the crash at this early stage of the investigation. One of the items being looked at is the position of the plane’s wing flaps, which were set at 10 degrees in the cockpit, Schiada said. He declined to say whether that was normal, and said investigators wanted to examine the wings to see what position the flaps were actually set in. The founder of a corporate-aircraft business in Seabrook, N.H., said the deep experience of the pilots, combined with lengthy skid marks at the scene, indicate that a catastrophic emergency, possibly a fire, prompted the crew to abort the flight to Atlantic City. NTSB investigators brought reporters to the crash scene Monday. The jet’s broken skeleton lay strewn across the sides and bottom of the gully, about 600 yards from the end of the runway. A strong smell of smoke and burned debris hung in the air as investigators from the NTSB, the FAA, Gulfstream, and Rolls-Royce, which manufactured the engines, pored over the scene. The nose of the plane was generally intact but had been sheared from the fuselage, which was smashed into a jumble of glinting metal. Cabin seats for passengers were blackened and scorched, the wings lay flattened near stagnant, brown water at the bottom of the ditch, and the jet’s two engines were tilted upward near the lip of the gully. Ruts from the jet’s landing gear, one from each wing and one from the nose, had dug deep into grass that extended 800 feet from the end of the runway pavement to the ditch. In the grass lay the nose gear and the left main landing gear, both of which had broken off. On Monday, a person who answered a phone listed for McDowell, the pilot, said the family did not want to comment. De Vries’s family could not be reached, but neighbors described the copilot as an easygoing man who kept a meticulous garden. They often saw him sitting on his front porch or working in the yard with his wife. Haesook Lee, 65, said De Vries’s wife knocked on her door Sunday to tell her of his death. Lee said she had seen De Vries probably two days before the crash and will miss him. Benhoff, the flight attendant, worked for SK Travel — the North Carolina corporation that owned the plane, according to FAA records — said her 29-year-old stepson, Matt Benhoff. She was close to the Katz family, he said, and Katz’s wife had once attended Benhoff’s birthday party. “I think she helped take care of the food and the travel and the car arrangements” for Katz’s trips and often flew with the two pilots, Benhoff said. Katz and his acquaintances boarded the jet after a celebratory kickoff for the Concord River Institute, a multidisciplinary training program for teachers, administrators, and students founded by Michael Goodwin, the son of the hosts. Katz amassed a fortune from investments in parking lots and the cable network for the New York Yankees. In 2012, he was part of a group that purchased the media company that includes the Inquirer, the Philadelphia Daily News, and the news website Philly.com. Last week, Katz and H.F. “Gerry’’ Lenfest bought out the other partners to take control of the company. Katz also had owned two professional sports teams, the New Jersey Nets of the National Basketball Association and the New Jersey Devils of the National Hockey League, and had been a longtime minority owner of the New York Yankees. A public memorial service for Katz is scheduled for 11 a.m. Wednesday at Temple University in Philadelphia, where Katz was an alumnus and trustee; he gave the university its largest single donation. @globe.com; Travis Andersen at travis.andersen@globe.com.